Is my game working well on real hardware ? It works like on 4DO ! Vigoroth the delivery man for the 3DO ! Ladies & Gentlemen , i present to you my homebrew game for the 3DO ! 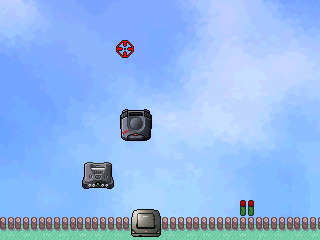 -In the first mini-game , you must deliver 15 packages. -In the second mini-game , you must avoid the trucks on the road. 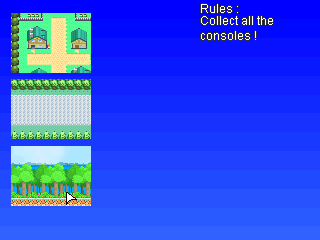 -In the third mini-game , you have to collect all the consoles. -The fourth mini-game is a shooting game. Protect the M2 ! It works well on 4DO with an official bios and on a real 3DO. I want to thank Rastersoft for his work on the 3DO and his tutorial to set up the devkit. This port on the 3DO has now sound effects & Music ! Stable Release 1.0 (No music , works on a real 3DO). Last edited by blabla on Thu May 23, 2013 12:53 am, edited 9 times in total. 3DO Experience wrote: Wow Awesome! 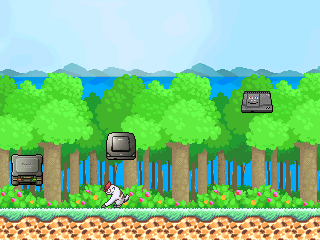 I'm working on the third mini-game , you will have to collect all the 3DO falling from the trees. If one of them is not collected , you lose. Thank you!. Keep up the good work! Trev wrote: Thank you!. Keep up the good work! The third mini-game is already completed ! Now , i'm working on the last mini-game. You will have to protect your 3DO & M2 and shoot on the Nintendo 64 , the Atari Jaguar & the Sega 32X ! I'll release the complete game (with no sound) tomorrow or maybe this night ! Very cool! I will have to give the demo a try. You should print out inlays and sell these on cd-r once you have it all nailed down. Id buy one. The game is completed ! See my first post to download the full version ! grimm wrote: You should print out inlays and sell these on cd-r once you have it all nailed down. Id buy one. It works on 4DO with an official bios but i need your feedback. And the game is partially optimized for PAL consoles... Only the first mini-game uses the PAL resolution (384x288) correctly. Last edited by blabla on Sat Feb 16, 2013 1:42 am, edited 1 time in total. Sorry, i cant help you there. I dont have my pal machine set up anymore, and i dont mess around with emulators im afraid.. Hopefully someone else can give you feedback on this. Just throwing my vote in: Great job! grimm wrote: Sorry, i cant help you there. I dont have my pal machine set up anymore, and i dont mess around with emulators im afraid.. Hopefully someone else can give you feedback on this. No problem grimm , you can still test on your ntsc machine once you're free. JohnnyDude wrote: Just throwing my vote in: Great job! I'm planning to add music in my game and then I need to remove any copyright materials. I must know if my game is working well on the 3DO. Once all of this done , i will be able to sell my game. I'll try to pull out my Sanyo to see if it works on that ok, it should if it works on the others. You might want to check out Hosted disc images. The first homebrew game is there as well as mini-games and other projects. 3DO Experience wrote: I'll try to pull out my Sanyo to see if it works on that ok, it should if it works on the others. Tell me if my game is working on real hardware ! 3DO Experience wrote: You might want to check out Hosted disc images. The first homebrew game is there as well as mini-games and other projects. Well yeah , it's not technically the first homebew. I have to agree with Icebreaker 2 being the first home brew. It was made by someone in the industry but I don't think Panasonic ever had plans to publish it. Plus it has a bunch of mini games in it too. The game has now music and 3 languages ! Isn't it beautiful ? Download link at my first post ! Old Gregg wrote: I have to agree with Icebreaker 2 being the first home brew. It was made by someone in the industry but I don't think Panasonic ever had plans to publish it. Plus it has a bunch of mini games in it too. i think nobody will complain about it ! EDIT : Vigoroth the delivery man works on a real 3DO ! I am going to try and test this out soon. Currently my 3DO is not hooked up, but I have space for it in the entertainment center and have planned to hook it back up for a while now (other things always keep me from getting around to it). When I do I will try to burn a disc and give it a try on real hardware. Looks like everyone who voted in this poll can't burn to test ... that is the case for me as my computer is being repaired and I'm stuck using a tablet. I might try it sooner than expected. I received my massive package of 3DO goodness today from Dreygor, so I'd be lame to not hook my system up again and start digging through those games I got. And burn a copy of this homebrew and try it as well. The next release of 4DO will recognize the game. Great work! Trev wrote: Looks like everyone who voted in this poll can't burn to test ... that is the case for me as my computer is being repaired and I'm stuck using a tablet. It's just a matter of getting to my 3DO's, you know how hard that can be... for me. Just tried it on my PAL 3DO. No joy I'm afraid. 3DOKid wrote: Just tried it on my PAL 3DO. No joy I'm afraid. I just tried on a NTSC Panasonic FZ-1, but it didn't work for me. I haven't tried burned games before, so don't count FZ-1 out! To burn the game , try to burn the iso file with ImgBurn at the LOWEST speed as possible. Okay, just burnt and tried the disc. I am using an NTSC - U FZ-1 model 3DO. It boots up to the loading screen and then jumps to the language select screen. You select the language and then the screen goes black and it reboots back to the 3DO logo and repeats the same thing. Obviously the game tries to start. If you could iron out that bug, would be pretty darn cool to get more homebrew on the 3DO. The system is so nice, it would be nice to see it have the kind of homebrew scene the Jaguar has. Get this running and it's another great step in the right direction! T2KFreeker wrote: It boots up to the loading screen and then jumps to the language select screen. You select the language and then the screen goes black and it reboots back to the 3DO logo and repeats the same thing. Have you tried the earlier version i posted before your post ? Hmm, no, I have not tried the version 1.0. Perhaps there are other people doing the homebrews that can help out? I will try the version 1.0 also and see what happens. Perhaps if you contact Rastersoft, they could help with this? cdoty was a cool cat when he was in the Jaguar community and used to help developers out there in the development section all the time, if I remember correctly. You might ask him and he might be able to help you out? I'll let you know about version 1.0 shortly. T2KFreeker wrote: Hmm, no, I have not tried the version 1.0. Perhaps there are other people doing the homebrews that can help out? I will try the version 1.0 also and see what happens. Perhaps if you contact Rastersoft, they could help with this? cdoty was a cool cat when he was in the Jaguar community and used to help developers out there in the development section all the time, if I remember correctly. You might ask him and he might be able to help you out? I'll let you know about version 1.0 shortly. Thanks everybody for your support and your help ! Hmm, so any luck getting the music issue worked out? I'd love to hear it. Oh, and yes, version 1.0 does work on my FZ-1 system. Sorry about that. Been a bit since I have been around really.